Everett Ray Aponte is an actor, writer, and director who has been making movies, according to imdb, since at least 2003. He has acted in movies like the short films Meat and Samuel de Mango and the features Shilo and The Hitman Agency (he also directed Shilo and Samuel de Mango). 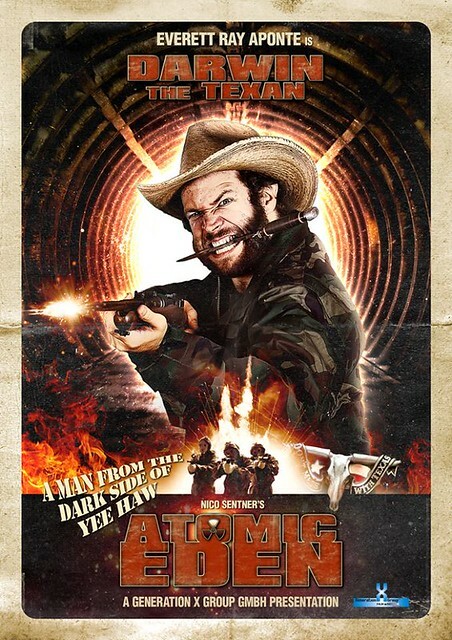 His latest movie is the low budget action flick Nazi Doomsday Device (aka Atomic Eden, which was recently released on Amazon Video UK and Vimeo On Demand. In this interview, Aponte talks with this writer about making Nazi Doomsday Device, his career so far, and more. Bryan Kristopowitz: How did you get involved with Nazi Doomsday Device? Everett Ray Aponte: Well, I met Nico at the AFM (American Film Market) in 2011, and we instantly became friends. When he later found out I was from Texas, he didn’t believe me. He then showed me a picture of someone he met who had the stereotypical look of a Texan, and I said, “Oh he’s from Houston.” “How did you know? !” He exclaimed. 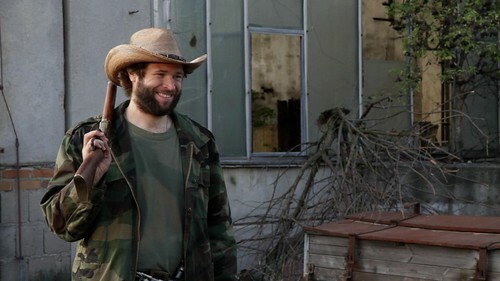 “Because, I’m from Texas! !” That’s when he created Darwin and saw no one else playing that character but me. BK: How did you approach your character Darwin in Nazi Doomsday Device? How much of what we see from Darwin is directly from the script and how much of Darwin is you? ERA: LOL, Darwin is like a lot of people I know, so I basically exaggerated how Texans sound and act. The exaggeration is all me. I was class clown in high school, so I like to have fun, and Darwin is bigger than life, so he was perfect for me. BK: What was it like working with the cast of Nazi Doomsday Device? What was Fred “The Hammer” Williamson like to work with? 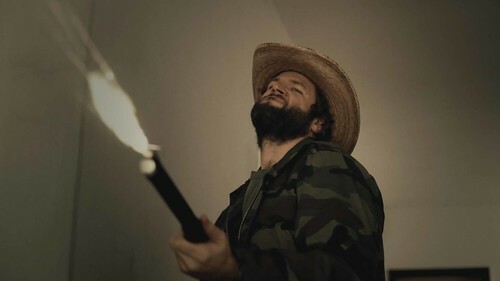 ERA: Through the chaos of making a low-budget indie flick and the challenge of helping folks with their English (I’m a certified TEFL English teacher), working on this film was so much fun. The people involved were so lovely and enjoyable to be around. And Fred, Fred, now there’s a larger than life guy. His experience on these kind of films really showed, and his capacity for friendliness and understanding was comforting. I can’t say enough good things about Fred. BK: What was it like actually making Nazi Doomsday Device, especially the abandoned mining facility set? BK: What was it like working with director Nico Sentner? ERA: It was interesting, because you can tell it was his first time directing, but boy did he have a vision! He was easy to work with, because we became friends. A lot of the time, I didn’t know what was going on because most of the time he was speaking German to the crew, but all sets have the same body language, so it was fascinating to see people act the same in a different language. At some points I was surprised Nico held it together, other points I was surprised the crew held it together. You know, like every movie set. What’s great about Nico is that he really knows it’s a team effort. He’s also producing the film, so at some points he needed me as the AD to step in and push the shooting along. It’s the respect he has for the crew that makes him a good leader. BK: You worked with fellow Nazi Doomsday Device actor Dominik Starck on his movie The Hitman Agency. What was that experience like? ERA: It was also a very similar experience. On Doomsday, Dominik and I were roommates, so we developed a rather close relationship. Basically, it was like working with a friend again. Hitman was a lower budget, so it didn’t have all the craziness and guns that Doomsday did, and my character in Hitman wasn’t as over-the-top, but my experience working with Dominik and his crew was just as fun. BK What was the hardest part of making Nazi Doomsday Device for you? The easiest? ERA: The hardest part was the language barrier. I was also AD and language coach (you wear many hats on low budget films like these), so I had to use body language a lot to get my point across. The easiest part was eating delicious German food, especially the food Nico’s Mom would make. Also, it was pretty easy to play Darwin – all I had to do was have fun! BK: According to imdb you’re also a director. Do you prefer directing to acting or do you intend to do both as your career progresses? ERA: I intend to do both. I had an experience in high school that disillusioned acting for me. So I made a promise to myself that I would create my own work to act in. That’s when I fell in love with directing. Given the opportunity, I’d probably take directing over acting, but I am always looking for ways to do both. BK: Who are your moviemaking heroes? ERA: Too many to count. Charlie Chaplin, Buster Keaton, Jackie Chan, and Mel Brooks. Woody Allen and Mel Gibson (the filmmakers, not the persons). Stanley Kubrick, Hitchcock, and Tim Burton. I can totally keep going, but I’m gonna stop there. BK: Any upcoming projects you can tell us about? BK: Why are you credited as “Everett Aponte” on some movies and “Everett Ray Aponte” on others? At least that’s the way I want it to be. Doesn’t always happen that way. And to answer your question, I’m not sure why. Just sort of started happening that way. BK: If Nico Sentner told you tomorrow that he wanted to make a Darwin spinoff, would you do it? ERA: I would do it in a heartbeat! A very special thanks to Everett Ray Aponte for agreeing to participate in this interview and to david j. moore for setting it up. 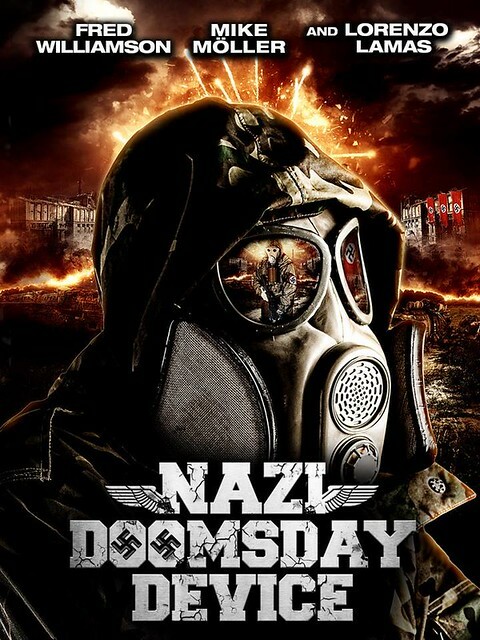 Check out my review of Nazi Doomsday Device here. Check out the Nazi Doomsday Device Facebook page here. All images courtesy of Nico Sentner and Generation X Group GmbH.